In November 1984, during Michelle Robinson’s tenure as a TWC board member, that board maintained that nonwhite students should have the right to bar whites from its meetings on campus and from its meetings with school administrators. Of the 19 elected positions on the organization’s board, two were reserved exclusively for each of the five ethnic groups TWC claimed to represent: Asian, Black, Chicano, Puerto Rican, and Native American. TWC played a key role in bringing to Princeton’s campus a host of radical speakers, including such notables as Hassan Rahman, the Palestinian Liberation Organization’s deputy observer to the United Nations; David Johnson, affiliated with the terrorist group FMLN; former Jamaican Prime Minister Michael Manley, a committed socialist; William Bowen, the architect of Princeton’s racial preference programs; Roberto Vargas, a pro-Sandinista, pro-Che Guevara poet; Miguel Barnet, a pro-Castro writer and ethnographer; Manning Marable, a renowned black Marxist; and a number of ACORN representatives. 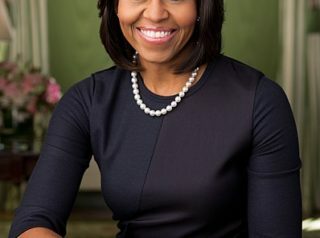 Mrs. Obama was honored by Essence magazine in May 2006 as one of the “World’s Most Inspiring Women”; by Vanity Fair in July 2007 as one of the “World’s Best-Dressed Women”; and by 02138 magazine in September 2007 as #58 in “The Harvard 100” list of that university’s most influential alumni. During the week of June 21-27, 2011, Mrs. Obama and a 21-person entourage went on a so-called “good-will mission” to South Africa and Botswana. The trip’s transportation expenses alone cost U.S. taxpayers at least $424,142. That figure does not include costs for food, lodging, and ground transportation. According to “White House sources” cited by The Daily Mail in August 2011, Mrs. Obama may have spent as much as $10 million on vacations during the preceding year. In the spring of 2012, Kristin Hull, a member of the a pro-Castro, pro-Hugo Chavez, pro-Hamas organization Code Pink, presented Mrs. Obama with a petition that urged peacekeeping rather than war with Iran. Among the document’s 20,000 signatories were such luminaries as Gloria Steinham, Alice Walker, and Eve Ensler. According to Code Pink co-founder Medea Benjamin, “Ms. Obama thanked Hull for her advocacy and said, ‘Keep up the great work.’ As Hull was walking away after her photo with the First Lady, Michelle Obama grabbed her hand, squeezed it and said, ‘We really need you. '” Another Code Pink co-founder, Jodie Evans, also related this story, via email. “[A]ll of us -– men and women here in this room and around the world –- we must do some serious self-reflection. We must look inside ourselves and ask, do we truly value women as equals, or do we see them as merely second-class citizens? We must look around at our societies and ask, are we clinging to laws and traditions that serve only to oppress and exclude, or are we working to become more equal, more free? At an October 2014, political rally in Philadelphia, Mrs. Obama emphasized how vital it was for “women and minorities and young people” to go to the polls on election day. Republicans, she explained, counted on “folks like us” not to vote. Also during that same speech, Mrs. Obama noted that Argentina’s parliament had one of the world’s highest percentages of female representatives, and that the country had already elected a woman as president and vice president. “Milestones that my own country has yet to achieve,” she added.